We had given you our readers all the details of the white wedding a few days before it happened. Now we have gone the extra-mile to bring to your viewing pleasure some of the happenstances at the event in glowing colours. We have thought to allow the pictures speak. Like you all already know, the solemnization of Holy Matrimony was at Our Saviour's Church, Tafawa Balewa Square, Onikan, Lagos and the guests had been fore-warned on their iv's to make sure to be seated by 1.30PM, while the actual service started at 2PM. The grand reception, to celebrate the friends, family members and all, was at the Muson centre, which was not a far distance from the church at all. The very excited Nollywood hunk and his equally gorgeous Doctor -Wife both looked fantastic, on their day of joy. To add a touch of class to the wedding, the appreciative bride and groom, were said to have commissioned some exclusive perfumes, which were made especially to the preference of each of those it was presented to. Both mothers had theirs, then the bride's dad and then those on their train. As expected many of Chidi's Nollywood colleague were in attendance. We wish the new husband and wife a blissful future together in joy, happiness and increase. All pictures exclusively for maestromedia. ...YOU GAVE ME THE KISS OF LIFE..
For a maiden fashion showcase, one must really commend the creative director of the brand- Ada Mgbudem. She was able to bring together all the elements, that makes a show standout- good and appreciative guests- the likes of Ndidi Obiora, Vivienne Chioloji, Anu Amusan,Osayi Ezigbo Esere, Telo Abili,Titi Okoye,Kunbi Oyelese, first class event venue- the expansive Hall of the Oriental Hotel, the showcase in itself, must be commended- the clothes were gorgeous and they sat well on the models who wore them and generally everything was lively and on point. As always the MC of the day- the ever delectable Ifeoma Williams gave a good account of herself, as she did her job impeccably well. The evening's artistes- first was Nigeria's own Michael Bolton- Timi Dakolo, whose voice is out of the world and was superb on stage. So also one of the most delicious candies on the music scene- Tiwa Savage who apart from looking very stylish, her performance got most of the guests on their feet dancing to her medley of songs. Here is the out and about at the showcase for your viewing pleasure. Let's do a quick comparison. While Kim Kardashian is the top American socialite and reality TV Queen, who is Kanye's heart-throb right now. Lilian Unachukwu is a celebrated fashion stylist based in Lagos, Nigeria. Whose asset looks the best? Kim K or Lil U. PLS TELL US. Foremost Celebrity couple Tunde and Wunmi Obe, a.k.a T.W.O, have finally released their second video compilation. The videos in the hugely anticipated DVD are from the duo’s bestselling fifth album “T.W.O Legit..” which was released in August 2010. The DVD, which is already circulating nationwide, starts with the witty “Zombie” and “Fine Bara”, but steadily ascends to the demonstrative “T.W.O Legit” and “Believe in me”. The colourful “Hit the dance floor” and never before seen “Atewo” also make it on the collection. Atewo, pundits say, will be a hit with the fans, even as TV channels across the country are already showing love to the video directed by Gbenga Salu. “We got a lot of mails requesting for videos of most of the songs on our ‘TWO Legit..’ album. It’s been a few years since we did the last DVD – T.W.O 4 Real - and we hope that fans will connect with the videos and messages from this one also,” Tunde Obe says. Marketed and distributed by Obaino ventures. The DVD features six songs shot and directed by two notable directors, Clarence A. Peters and Gbenga Salu. Gbenga Salu, who directed three songs from the compilation – including the newest and must-watch video, ‘Atewo’ - says the pair had a genuine connection. “They were very enthusiastic and willing to endure the grueling long hours that it took to shoot the video, without once complaining, and this helped me to bring out the best in them. 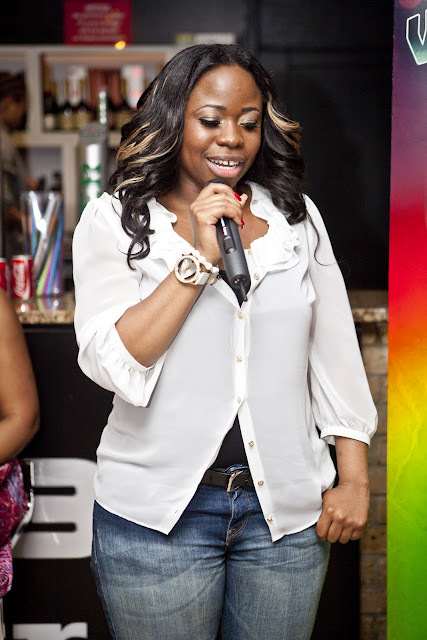 Atewo features guest appearances from J martins and Terry G.
Tunde and Wunmi Obe started out as lead singers in the wildly popular campus band, Turning Point in the late 80's and got popular Nationwide with their hilarious weekly television performance on the Charly boy show and Zoom time. Over the years, the amiable couple has developed their other talents and greatly improved their stage performance through hard work, consistency and flexibility. It is finally happening hoorayyyyyy!!!!!!. It has taken 35 long years for it to happen. We are sure you all wondering what we are yapping all about? It's the ‘grandmother’ of all music concerts in Nigeria. 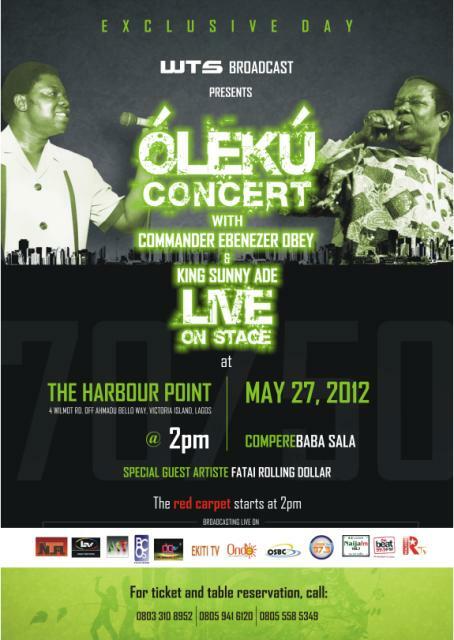 The well-thinking organisers have tagged it- OLEKU CONCERT! To many it is a day to work towards, come May 27, 2012 at the Harbour Point on Victoria Island, Lagos, connoisseurs of good taste, those who understands very well what fun and enjoyment at the highest level is, would gather at the venue in a first class, 7-star environment to be serenaded and swept off their feet, by the 2 masters of Juju music- Chief Commander Ebenezer Obey Fabiyi, who only clocked 70 a few weeks back and King Sunny Ade, who also not too long ago celebrated- 50 good years of dishing out the best tunes and songs. What many have tried and failed to achieve, has now become possible, thank God for WTS broadcast. Let’s try to create the day’s atmosphere for you all, a gathering of not more 800 guests, made up of the patrons, matrons of the 2 legends, and we can bet, that you all know the caliber of those set of people, garnished with other people of good taste, in a full dinner setting, where apart from listening to the purest of good music, there are people at your beck and call, waiting on each guests every move. There are 2 types of tables available, each seating 8 people- the family tables and the corporate tables, a few limited numbers of single tickets. You step into a well-decorated hall, where the ambiance first embraces you. You and your table-mates are then led to your table and lo and behold waiting for you, are special gifts with your names inscribed on it, like highly honoured guests that you are. Let's leave further description for another day. The class of sound, music....we need not talk about, because those who know the 2 legends know, they do not compromise on standards. Just get ready to be taken on a great and fantastic musical journey; you would literally be swept off your feet by the magic that would pervade the air. For further enquiries on tickets and table reservations- Please call the following nos- 08033108952, 08059416120, 08055855349 and 08023040687. 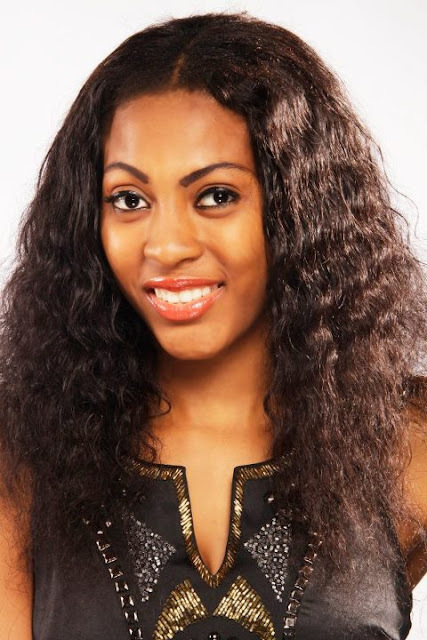 MBGN 2012 CONTESTANTS REVEALED- who is/are your favourite(s). This year's edition like you all already know is the silver jubilee edition. We are all expecting some new things & surprises from the organisers. It would take away from the excitement, if it’s the same old thing that’s been done year in, year out. Now that the venue for this year’s edition is in Benin, Edo State, will the goddess of beauty favour the contestant from Edo State? 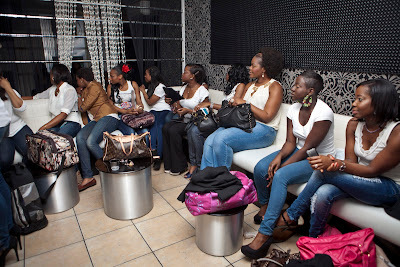 Who amongst the 32 gorgeous and highly expectant ladies is favoured to win the crown? Whose head is big enough to wear the highly coveted crown? Come May 5, 2012 the lucky one would be revealed for all to see. Meanwhile, we have the pictures of the 32 state queens, vying for the ultimate prize- the MBGN 2012 Crown. We would like you all to be the judges, if you were to choose from the 32, who would you all pick, who would be your favourite. What if your votes count? Check out the pictures and tell us your thoughts. Waoh!!!! We just have to commend and congratulate the organisers of what has become the most prestigious beauty pageant in Nigeria. The Silverbird Group with the great Ben Bruce at the helms of affair has done well and they deserve a bow or many bows from all and sundry. It's not a small deal, to hold to one's dream for a quarter of a century, especially if you now look around and find out that most brands you started with many years ago, who had more prospect at succeeding are now, nowhere to be found. No need to start reminding ourselves about the history of the pageant, which originally began in 1983 as Miss Universe Nigeria, but later transformed to what it is now- Most Beautiful Girl in Nigeria pageant in 1986. The winner of the maiden edition of the MBGN in 1986 was Lynda Chuba Ikpeazu, who later on in life, very recently was a law-maker at the House of Representatives. Many other winners were Omasan Buwa- 1987, Bianca Onoh now Ojukwu- 1988, she's the new Nigerian ambassador to Ghana, Regina Askia- 1989, Sabina Umeh-1990, Nike Osinowo, now Nike Soleye- she is presently, the creative director of another beauty pageant- Miss Nigeria, she was the MBGN in 1991, Sandra Petgrave- 1992, Rihole Gbinigie- 1993, Susan Hart- 1994, Toyin Raji- 1995, Emma Komlosy- 1996, Chika Chikezie- 1998, Angela Ukpoma- 1999, Matilda Kerry, now a medical Doctor- 2000, Agbani Darego won in 2001,but later that year became Miss World- 2001, her first runner-up Ann Suinner completed her reign, Chinenye Ochuba- 2002, Celia Omotu Bissong- 2003, still deliciously gorgeous Anita Uwagbale now Iseghohi- 2004, Omowunmi Akinnifesi- 2005, Abiola Bashorun- 2006, Munachi Abii Nwankwo- the ex-beauty queen now turn rap-queen- 2007, Adaeze Igwe now Yobo, married to the National Football team's Captain- 2008, Glory Chukwu now Umunna- 2009, Amuzie Afora- 2010 and the out-going queen- Slyvia Nduka- 2011. A long history of very gorgeous Queens don’t you all think? So who would be the new queen for 2012? There have been 26 queens in all before now; this year's edition would make the 27th one. The battle for the prestigious crown has shifted again from its customary choice of state- Lagos to Edo state. We hear the Edo State Government is actively involved in this special edition of the pageant, which marks the brand's Silver Jubilee. So come May 5, 2012, all roads would lead to the Best Western Homeville Hotel in Benin, Edo State. 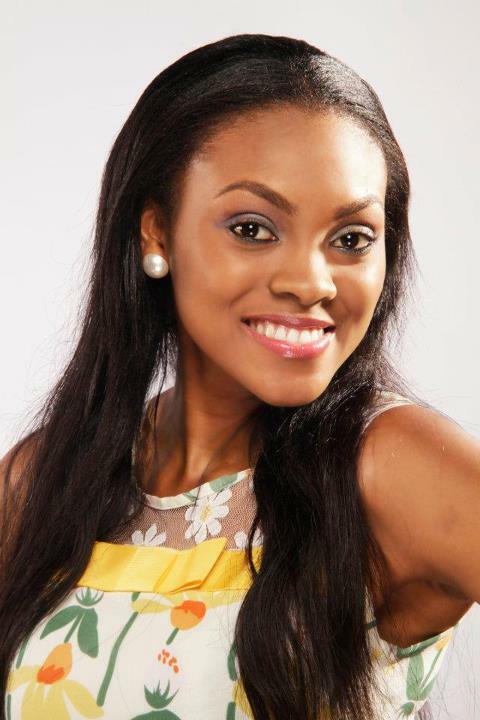 Many aspiring queens would gather to vie for the crown of the MBGN 2012- the 25th anniversary edition, the eyes of many would be focused on either STV or ears glued to Rhythm Fm stations to follow the proceedings. According to our findings, Miss Toke Makinwa of the Rhythm 93.7 FM station would be hosting this special edition. May the best contestant of the whole lot, wins!!!! And we have for your delight, pictures of some of the ex-queens. SO ITS NOW OFFICIAL- MAJE PROPOSES TO TOKE ON BENDED KNEES. We are still on the subject of love. We think many many things- weddings, engagement would be happening this year oooooo. It's like many have made up their minds that, this year 2012 would not pass them by. Just about some days back, Maje Ayida, who is Toke Makinwa's longtime beau, declared his heartfelt love to her on bended knees and asked for her hand in marriage. And the deliciously beautiful bride to be, who is an OAP with the Rhythm 93.7 FM station, while also an anchor for 3 Live Chicks and who would be hosting the 25th Anniversary of the Most Beautiful Girl Pageant in Edo State, we hear was completely swept off her feet. We hear their love dance has been on since about 8 years now, and about 2 Thursdays ago, the suave, young man, who is into the health and fitness business-he owns Edenlifestyle Nigeria, right after coming home from a dinner date with the love of his life, like a perfectly orchestrated movie love scene, went down on one knee, and allowed the roman goddess of love-Venus to inspire his words, as he declared his love for Toke and asked her to marry him. 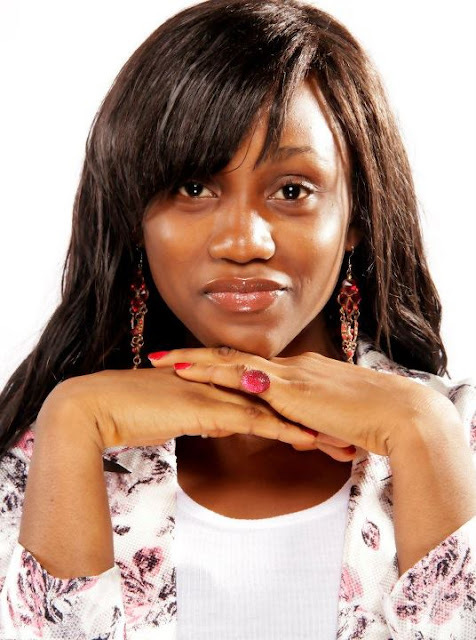 Toke, the hopeless romantic we heard, just melted in the embrace of love and accepted whole-hearted. Now that part 1 is out of the way. The duo are keeping their other plans very close to their hearts, but be sure we would give you all the details as they unveil. Congratulations to them. The race for the semi-finals of the Face of Women4Africa competition took place in London on Friday, April 20, 2012 at the luxurious Zubus Wine Bar, Holloway Road. 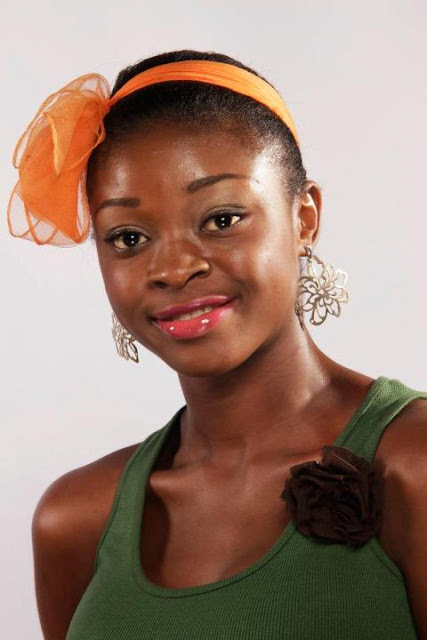 At the competition were 15 gorgeous and very intelligent beauties all vying to become the 'Face of Women4Africa. The fun-filled evening started with the 15 beauties having a make-over session, which totally transformed the already gorgeous girls to outstanding model-like beauty queens. 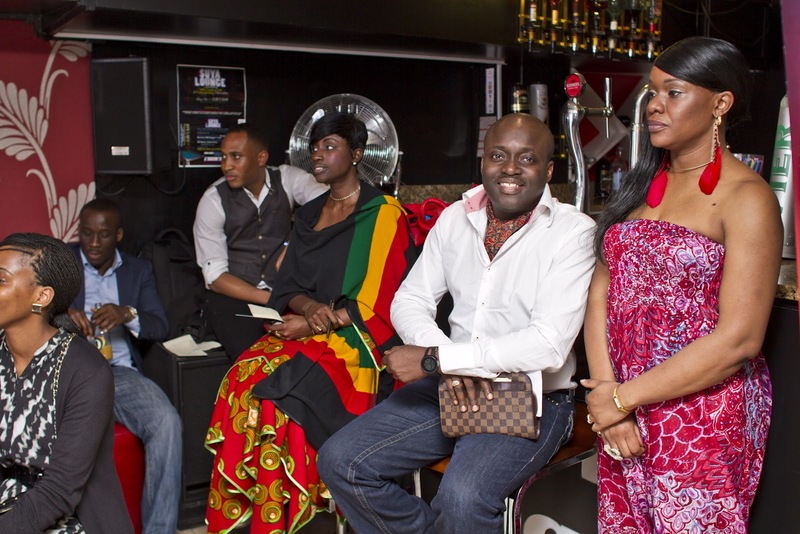 The minute the 15 contestants appeared before the Judges made up of Chichi Okafor (Miss Nigeria UK), Theodora Ibekwe (Founder of Miss Elegant UK), Ibukun Jegede (Model),Olu Solidvybz (a UK based entertainment guru) and Videlle Shah Thomas (Celebrity Model), the Judges immediately knew they had the hard task of picking the best 3 out of the lot. At the end of a grueling session of questions and answers, the best 3 out of the 15 emerged to a loud and very appreciative applauds from the audience, who had also participated actively in picking the best 3. Love seems to be so much in the air. Cupids’ arrow seems to be touching or striking many hearts. And we just love it! It's the season to love and be loved, we hear the creative genius behind Kinabuti- Caterina Bortolussi, the gorgeous Italian who loves Nigeria so much and the MD of Nimbus Art Gallery- Chike Nwabogu are presently in a Love Tango. We hear the love dance has been on for a while now, and the intensity of it has been increasing as the days go by, the duo are said to be head over heels in love with each other. Many of their mutual friends are of the opinion that something major could happen anytime soon. Caterina's fashion brand Kinabuti- is an Italian- Nigerian, ethical fashion label, which uses the fashion platform as a vehicle to train and empower women (young ladies from the ghettos) in Nigeria. 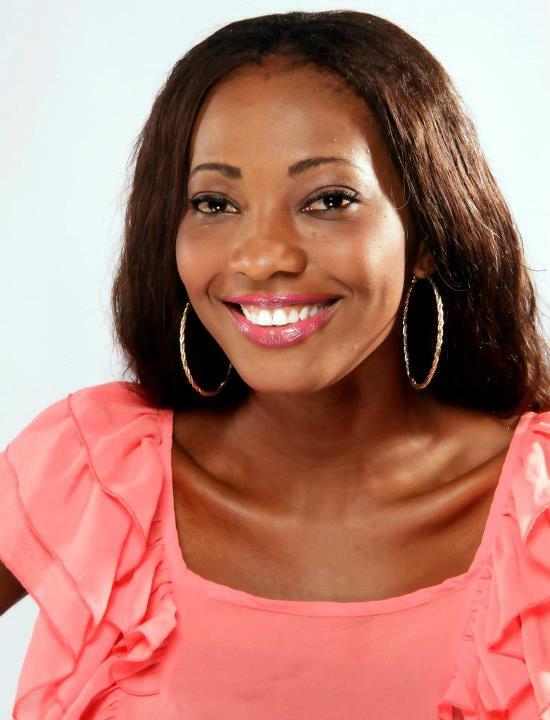 She has discovered many young girls, who normally might not have turned out well, from the ghettos of Port Harcourt and helped to train them as models. If all we hear is anything to go by, then we must congratulate this young couple for taking the giant step towards matrimony. 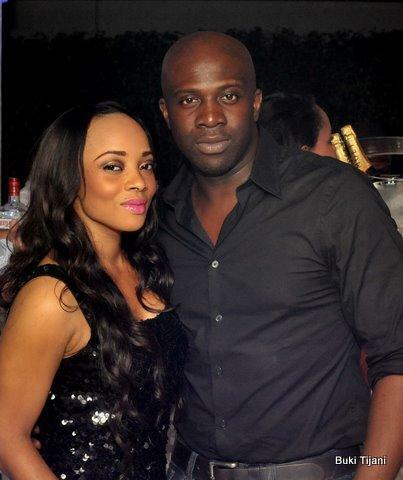 Felix Okoye one of the brothers behind SHAQ 24/7 is said to have popped the question sometime last week to his girl-friend of many years, the gorgeous and very delectable Wonu Odunsi, the co-owner of L' Espace and partner at the regular Le' Petit Marche, the end of the month bazaar like fair. 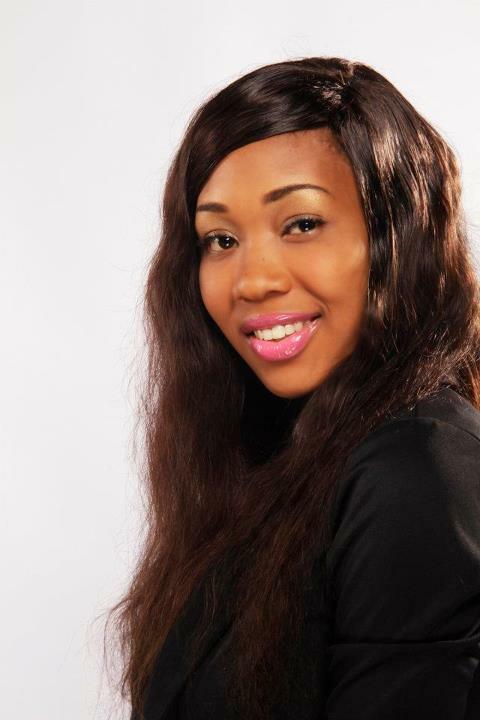 We hear arrangements are presently on going to have a summer wedding- August 2012 in Lagos. JEAN & CHIDI'S WHITE WEDDING SETS FOR SATURDAY, APRIL 28, 2012. Nollywood hunk and former Gulder Ultimate Search host- Chidi Mokeme also known to many as GQ, had a colourful traditional wedding ceremony last week in Owerri, the Imo State capital. He and a few of his friends and family members, celebrated the joy of love in the traditional way, as he and his new wife Jean Chinwe Olumba were joined together. Like we had said before in some other reports, the Igbos view the Igba Nkwu Nwanyi as the main deal, so no matter how big any other type of nuptial ceremony is, without doing the Igba Nkwu, the person's wedding is not acknowledged. With the traditional now out of the way, the stage is set for a glorious white wedding, come this Saturday, April 28, 2012. The beautiful scroll like invitation has already gone out to many of those to grace the occasion. 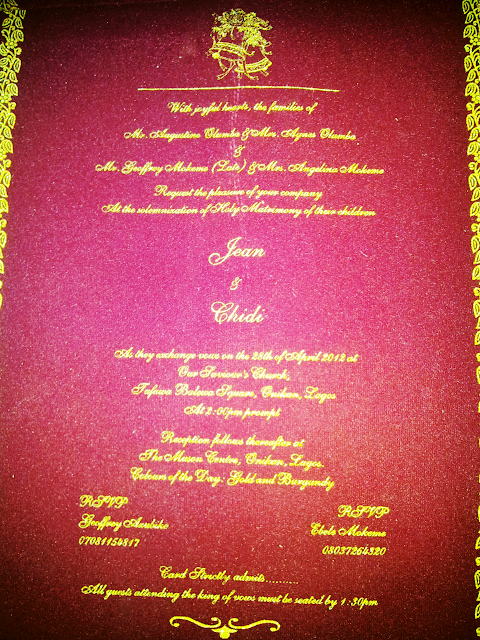 The burgundy coloured invite with gold letterings was in a beautiful gold case. From this little description it says it all, that the colour for the day is Gold and Burgundy. Here are a few of the pictures of the traditional ceremony in Owerri, the Imo State capital. One of Chidi's friends- Julius the 'Genius' Agwu was the MC at the event. Jean Olumba Mokeme, is a Baltimore, USA based Medical Doctor, who has found her knight in shining armour in Chidi, while GQ up until last weekend, was one of Nollywood's most eligible bachelors. we WISH for them the very best of marital bliss. KANYE WEST & KIM KARDASHIAN'S LOVE MATCH? IS SASHA P PREGGERS ? WHO IS AFRAID OF PRINCE TONYE PRINCEWILL?